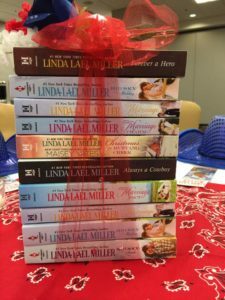 “First Lady of the West” Linda Lael Miller wanted to thank her readers for their support over the years with an event during the 2017 RT Booklovers Convention in Atlanta, so NBPR put together a fun Rhinestone Cowgirl Party, attended by approximately 200 readers. Guests were treated with blue sequined, LED-lighted cowgirl hats, centerpieces of books for readers to take home, fabulous door prizes, scrumptious western-style food and western music—with Linda and her Harlequin publishing team greeting all at the door. Six readers were selected for their western-style attire to go to dinner with Linda that evening! The party and the dinner generated many social media posts and fun memories for all who came.